We were away on holidays and were pleased to come home to our beautiful kitchen floor. Great service! Thank you. I wanted to send a note and mention the great service by the installers today. Extremely professional and a top-notch job. Completed on time and excellent workmanship. Jeff at Atlanta is fantastic! He goes beyond his role to ensure everything is perfect. Michael installed flooring he was a perfectionist. Jeff located tile required to finish a job and it had been discontinued. He found it. We are very satisfied of David's work. Everything was clean when he left and the installation was properly done and respectful on the place he was working on. We are delighted with the service we received from beginning to end. We appreciated all the information we were given when choosing our carpet and the installers were quick, polite and cleaned up really well! We are very very happy with the promptness of getting the doors installed. On time and a very positive experience-- cleanup was excellent, and care was taken every step of the way. Those 2 fellows can work in my house any time! We were very happy with Atlanta Flooring. Everything from the salesperson, to the person who contacted us as a reminder of the install date, to the installer was professional and pleasant to deal with. The installer did a great job of installing the flooring and we are very happy with the flooring and how it looks. Your installer was exceptional !!! Extremely courteous and professional, most impportantly did an amazing job !!! In the future if ANYONE asks me do I know any flooring companies, I will not hesitate to recommend Atlanta Flooring. Dillion was our installer. He was very approachable and helpful. He completed the work on time and clean up was great. I was very impressed with Dillion. He would make suggestions that made the floor look it was the original floor and not a renovation (which meant a few extra hours of labour for Dillion, but was quite happy to do it)! No negatives, all positives!!! If we were to get more flooring installed, I would hope Dillion would be the installer. The installers were polite and respectful, even helped me carry up extra furniture. They did an amazing job! I am very pleased with the service I received from Atlanta Flooring. Within a few days of inquiring, at no cost to myself your rep Ruth arrived. She was very informative, and gave me some much needed advice which helped keep my costs down. She always answered my numerous emails very promptly. I also was extremely happy with the work done by the flooring staff that installed my underfloor heating cables and thinset. Thank you very much for completing everything in very quick time. We are very happy with the job your installers did for us! They were in our home for a day when we were home and another when we were not and they were unobtrusive, cleaned up after themselves and were totally professional. The carpet looks wonderful!! The installer did a fantastic job installing the floor. He made great suggestions and used all of the tile in the best layout plan. He was punctual each day and worked very hard. We are very happy with his work and the floor looks great. Hi Alisa, We were very happy with the installation, crew could not have been better. They were polite, did an excellent job and cleaned up. Chad was great to work with. We will definitely recommend Atlanta as well as Ruth in sales. The installation was done excellently. We are very happy with the work. We will definitely contact your company when we need more work done. I am happy with job done on time and no mess left! Special thanks to Ruth who has a talent for assisting in choosing the right products and colour. Rob did a good job of scheduling and updating me. I wouldn't hesitate to recommend Atlanta Carpets. I would like to let you know that your installer Michael did a wonderful job for us. He went way above and beyond his job. He is a very skilled craftsman. We were very blessed to have had him install our flooring. The floor was installed on time and the installers were polite and friendly. They arrived when they said the would and explained what they where doing and as proceeded to lay our new floor. My wife and I are very pleased with the work and the speed with which our project was completed. I just have to tell you that I was very impressed with your installers. They did a fabulous job and the floor looks amazing. Very courteous and very hard working. Thank you. The installers were the best. The job was finished a day early! They did a fabulous job as did you guys getting this all arranged in our frantic schedule ! Thank you so very much ! The installer John came by Thursday to secure the baseboards and install the correct transition. The transition Ruth chose was perfect. Thank you, Ruth. And thank you, Alisa, for following up and seeing to our concerns. We are very happy with the floor and service Atlanta provided. The carpets look great and we love them! Clean up was awesome and troy was quick and efficient. We will definitely recommend you guys if anyone needs floors or carpet! Thanks for everything. The fellow who came and did our carpet on Tuesday was extremely thorough and very professional. At first we were surprised that he was taking on the whole job himself, but he applied himself and stayed until after 8 to ensure everything was done. We really appreciated his diligence and manner. Thanks very much. The flooring is indeed done, and the guys did a fantastic job! It looks beautiful, and they were very respectful and friendly while in our home working. Oh my goodness, your installers were fabulous! Very friendly and professional. Answered any questions I had and did a marvelous job of laying our laminate. At this time everything looks good...if there is any problem that we find we will let you know. They were very good at keeping our home clean as they were doing their job, and after they finished. Thank you so much for all of your help during this trying time. Thank you for the opportunity to give you some feedback on our carpet installation this past w/e. We were very happy with the 2 gentlemen who did the install. They were effecient, polite & very professional. They were sensitive to the fact that we needed the whole job done that day as we only had our 2 sons here till 6pm to help with moving furniture in & out of rooms. The clean up was very well done as well. I was also very pleased with the fantastic customer service I received from Ruth at store level. Overall, I wouldn't hesitate to recommend Atlanta Flooring to anyone we know in need of new flooring. Hi,I wanted to let you know that Edward has done a great job!He has done an excellent job and is an extremely hard worker.It is very rare that you come across a person who is such a hard worker and he literally didn’t stop the entire time he was here.Very impressed with him and his work ethic.I will surely recommend him/your store to others. Hey Ruth,just digging my toes into our new thick carpet.Thank you for your help with the purchase and install.As usual a pleasant experience working with you.Have a great day. I am very happy with the products and the people who did the work in my home. Cliff and Holly did the tiling and grouting in the bathroom and kitchen,and again,they did beautiful work and were so great to have around here for the day and half it took to get the work done. David and Holly and Cliff all did very high quality work,with the added bonus that they cleaned up after the work was done,so that there was very little for me to do afterwards...that rocks! I hope you have a great day,Alisa! My thanks to all of you at Atlanta Flooring. A quick note to say thank you for the most excellent service on all aspects of what has been done so far with updating our home.The wood installation crew was amazing.They did an awesome job with all details:from tear out,to install and finishing up.Fast,friendly,and professional.I really appreciated the care and attention to the details.A huge thank you to them!! This morning,I sent Ruth Sawatsky a note confirming the order for the blinds for our bedroom.She is a lovely lady,and I also appreciated the time she took with me to help select product to best fit the special needs of our particular windows. And a huge thank you to you for all the time you have invested to help me navigate the many parts involved with all the updating we are doing.Knowing your products,having systems in place,and excellent trades and service people to execute the delivery and top notch installation. 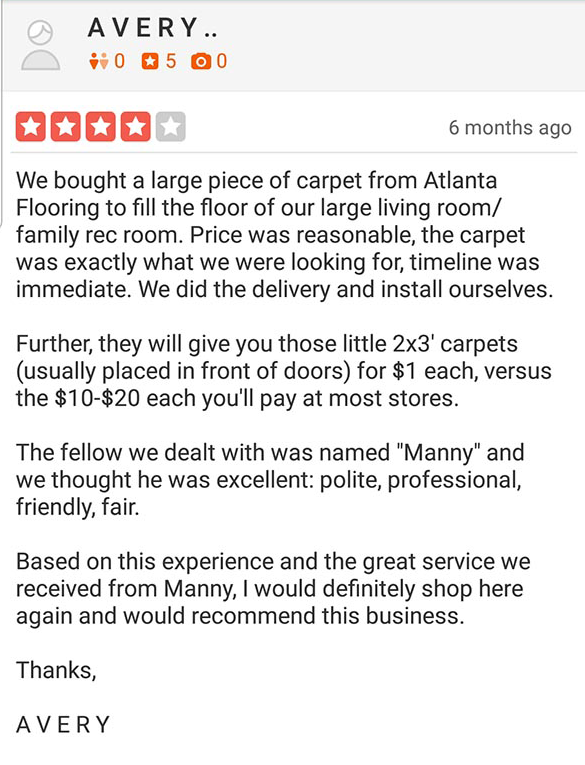 You not only made this a smooth process from initial meeting,to receiving end product…..you have also saved me more hours than I can count by being able to do all my business with your company.Very much appreciated,and I am happy to refer anyone looking for home updating to go to Atlanta Flooring Centre. Yes we are very satisfied with the materials and work done on the flooring in our home.Bill did make a call to Jeff about a little problem with the baseboards but the layers promptly came back within a couple of hours and remedied that.They worked hard,were efficient and tidy.It was a pleasure.Our painters were finished by Friday so we are now able to get all back in place and start enjoying all the new work.Thanks you to all. I would like to thank you for your Thank You note with the seeds(nice idea)and also for the great job done at our place by you first and then by your colleagues Rory and Alex.They were very professional and did an amazing job.We are very happy with our new laminate flooring.For sure I’ll recommend Atlanta Flooring to all my friends and acquaintances. Thanks again Ruth for your great service.We are so happy with the result!We love the floor!Randy did a beautiful job and so did the man who did the stairs(didn't catch his name). The house look 300% better! Hi Ed, Just wanted to let you know how pleased we are with our floor, and also, what a wonderful job Denny did of the installation. He worked so hard at that trap door making it absolutely perfect. It looks so nice and professionally finished. We were extremely impressed with his work ethic and attention to detail. Thank you for a job well done. Pat, just a short note to say "Thanks" for all the work you put into helping us with the repairs to our house. All too often people receive exceptional service from someone and just accept that as their due and say nothing. Not Here! The way in which you so very subtly "guided " us in picking the product we were happy with shows professionalism and tradecraft and we are truly appreciative. The fellows you sent around to do the laminate, Duane and Cullen, were 2 of the nicest and most knowledgeable people I have had the pleasure of dealing with. They went WAY out of their way to accommodate us and did just a fantastic job. Could you please pass on to them a heartfelt "Thank You" and please let the powers that be "upstairs" know how we feel. Should they, or you for that matter, ever need a reference feel free to give them our name. Once again, many thanks and carry on. Hi Ruth! Just wanted to let you know that our flooring job was completed on Friday and we are very happy with how it all looks. The whole process went smoothly! Thank you very much for all your help in choosing the right materials for each area. You really made the whole experience stress free! Just wanted to say “Thank you” for a job well done. The three young men who installed the vinyl in my laundry room last week worked so efficiently and did a beautiful job. Currently we are renovating my condo and I would certainly want that same team to do the installation when I get around to the hall and kitchen areas. We would like to let you know that we had reno's done in our kitchen A LOT of problems came about-of course your floor installer-Andy- was a savior!He went the entire mile and made everything so easy to deal with.Thank goodness for him!Thought you should know about your exceptional employee. My name is Jessica Harris and I ordered some vinyl through Ken who was very polite and accommodating with my needs as a customer.He came to my house to show me the flooring samples as well as suggested an upgrade on a better product that was on sale and saved me some money! Then I had the pleasure of dealing with your instalation men,who were perfect gentlemen and explained all my options and told me step by step what they were doing.They were even nice to my 2 English bulldogs(which as a dog lover means allot! ).They were quick and wonderful and should be rewarded for their abilities and customer service.I gave them both a $20 tip,wishing I could give more because they deserved it!And they were both very gracious and seems completely surprised by the jesture and said thank you and how it's nice to hear positive feedback from customers. I will also add I've been in customer service for 10 years and heard the good and the bad from customers.And I know a complement and a kind gesture goes a long way.The past 2 months I've been dealing with home renovations and every constuction worker and installer I've had has been a complete nightmare!So these boys just made my week!And restored my faith in the customer service aspect of home renovation! Good afternoon, I am sending you this note to say that my wife and myself are very happy with the product that we purchased and the fact that your installers were very professional in their work.Both workers arrived when your store indicated they would and finished within the allotted time. Thank you for the very good product and the professional way that the installation was completed.We will both spread the good word as to how your firm provides the service that you did.